Had a spill? You need Spill Kits Direct to your door - it’s easy! Do you transport liquids? Do you store liquids on your premises? Do you handle liquids in your day to day operations? If so, a Spill Kits Direct spill kit is your solution. With shipping Australia wide, Spill Kits Direct makes environmental compliance easy and affordable for environmental managers and small shop owners alike. A Spill Kits Direct spill kit is highly absorbent, effective and great value for money; cleaning up your spill in no time! Great for emergency spills. We have a spill kit for any kind of spill cleanup including chemical, oil and general purpose liquids. Our smaller kits are a perfect size to fit in your truck. 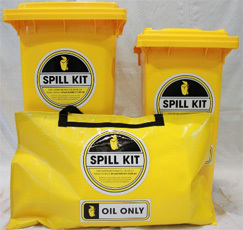 Spill Kits Direct offers a variety of sizes for you – kits come in 60L, 120L and 240L sizes. All spill kit sizes include absorbent pads, socks, pillows, disposal bags and PVC gloves for effective spill cleanup. Additional PPE including coveralls and eyewear is also available for purchase. Perfect for industries including mining, manufacturing, construction and transport - Spill Kits Direct is the most cost effective way to comply with today’s environmental and OH&S requirements. Spills can happen anytime and anywhere, whether transporting liquids or storing them on your premises. Large or small, a dripping valve or a major spillage could lead to serious implications for your company. Spill Kits Direct offers Australia’s most price competitive solutions for minimising your environmental impact and complying with today’s legislative requirements.